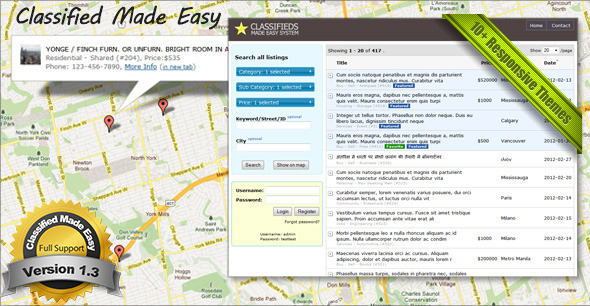 Classified made easy is an easy to use PHP script which can be used as classified or any kind of listing website. You can easily add,edit or delete categories. For ex, if you just want to use it as job listing website then you may create just job categories and related subcategories. Similarly you can use it for any other type of listing site. You can update any keyword such as �Category�, �Subcategory� to whatever you wish. The search results are also shown on Map for easy viewing. It is multilingual and you can add/edit any translation easily. You may also charge visitors for posting featured ads. This system can also be used as a directory listing site. This is responsive in design but may not fit well on smaller screen mobile devices. So if you plan to use it on mobile device then it is recommended that you first check the demo on your mobile device.